Bang & Olufsen launches 3D BeoVision 7-40 with Blu-ray | What Hi-Fi? Bang & Olufsen is strengthening its 3DTV ranks with the new BeoVision 7-40 model featuring a built-in Blu-ray player and active-shutter 3D glasses. You can watch TV on the new BeoVision 7-40 in both 2D and 3D. 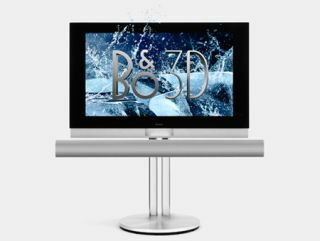 And B&O has been working on making sure both look good on the updated 40in LCD screen with additions like the double-sided LED backlight and improved contrast levels. The Blu-ray player supports the following formats: Dolby Digital 5.1/EX 6.1/EX 7.1/Dolby Digital Plus 7.1/True HD 7.1, DTS MA 7.1, DTS 5.1/ES 6.1, MPEG audio L1, LPCM and 7.1ch multichannel PCM. And the player is BD-Live compatible, able to receive extra content via the internet. The new BeoVision 7-40 will set you back an eye-watering £7600. Better start saving then. A 50in version is also available.